Toshiba Satellite L50D-B-14M 15.6" Quad Core Laptop AMD A4-6210 4GB RAM, 500GB. Toshiba L50D is designed in such a way that it has the capability to satisfy all kinds of users. This slim and light laptop is ideal for mobile computing as you can carry a complete hub of entertainment without carrying a bulk. It offers you high class audio and a wide range of connectivity options so you can take most out of your computing experience. 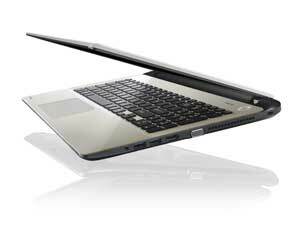 Toshiba L50D weighs only 2.2 kg and is only 23mm thin which makes it an ultra-portable laptop. This slim laptop casts a stylish look with frameless tile keyboard and large click pad. Its design gives it a distinctive stylish and modern look. 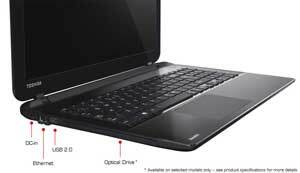 Toshiba L50D not just looks smart but it lets you work smart as well. Enjoy a rich, deep and vibrant audio with its Skullcandy tuned stereo speakers which are combined with DTS Sound. These built-in speakers create a well-balanced soundstage and immerse you in a realistic sound while watching a movie or playing a game. These speakers are positioned below the screen and combined with DTS Sound audio suite to give you an at most enjoyment of your media. DTS Sound includes a sound-enrichment suite that boosts volume, enhances bass and improves definition. So enjoy an immersive sound through built in speakers and headphones. 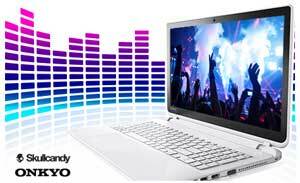 Have a 3D enjoyment of your media with Toshiba L50D. 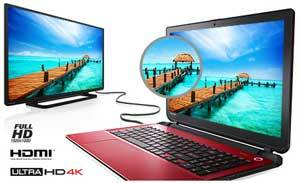 It comes equipped with an HDMI port which allows you to connect your laptop to large screen displays including HDTV and projectors. When you use HDMI port it streams audio and visual content through one cable so minimizes the need of multiple connections. Despite being light and slim in size, Toshiba L50D offers you a solid experience with more power. Powered by an AMD processor which also features a less power consumption system, it offers you all the power you need for multitasking. It also gives you faster access of your applications and other things. Having a huge storage capacity of up to 1TB it gives you enough space to store all your media content and heavy game without worrying about available space. Windows 8.1 is designed to boost up your computing experience from the core. With Windows8.1 you can put all those things which matter most on your start screen so you can spend more time in working and less time in searching. The fast and fluid design of Windows 8.1 is ideal for increasing your productivity. Wireless display technology allows you to seamlessly share content between devices, such as TVs and projectors. 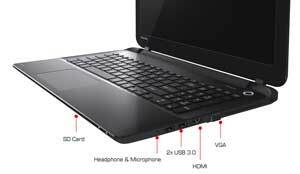 L50D comes equipped with one USB 2.0 port and two USB 3.0 ports. With USB 3.0 youll get fast data transfer as it gives you ten times more speed than USB 2.0. So it makes your data more portable as heavy files which took hours in transferring can now be transferred just in few minutes. Enjoy wireless connectivity with other devices and transfer your files in less time with Toshiba L50D. It features Bluetooth 4.0 and allows you to share files wirelessly over short distances. Bluetooth 4.0 is not just used for data sharing but it also allows you to connect peripheral devices like headsets, speakers, mice and keyboard. Toshiba L50D also comes equipped with Sleep N Charge USB port. This USB port allows you to charge your digital gadgets like MP3 players, cell phones and much more even when the laptop is turned off.